Quality CBD products can be difficult to find and that is why we only sell the best. Traditional medications tend to focus on symptoms. CBD promotes the body's natural response to the actual cause of those symptoms. Hemp Seed Oil provides nourishing protection to the skin. It has the high level of Omega 3 and 6 Essential Fatty Acids and high moisture content which helps repair and soften dry, damaged skin. CBD Oil (Cannabidiol) is a naturally occurring cannabinoid constituent of cannabis, derived from hemp, that does not contain THC, and thus is not psychoactive. Please consult your physician before using CBD products. Please note that they may interact with medications such as blood thinners, NSAIDs, and benzodiazepines. Earthly Body CBD Daily Massage Lotion offers a refreshing sensation on your skin to give you an extra bit of relaxation on those tense days. Non-greasy. Instantly soothes skin. Adds a feeling of comfort to your active lifestyle. Packed with Hemp CBD, essential oils, and cooling menthol. Directions: apply desired amount onto area of body being massaged. Rub into skin until absorbed. Reapply as needed. Store in a cool place or at room temperature. Ingredients: Water, Carthamus Tinctorius Safflower Seed Oil, Cocos Nucifera Coconut Oil, Caprylic/Capric Triglyceride, Glycerin, Stearic Acid, Cetyl Alcohol, Glyceryl Stearate, PEG-100 Stearate, Argania Spinosa Argan Kernel Oil, Cannabis Sativa Hemp Seed Oil, Aloe Barbadensis Leaf Juice, Chamomilla Recutita Flower Extract, Symphytum Officinale Rhizome/Root Extract, Avena Sativa Extract, Citrus Aurantium Amara Flower Extract, Panax Ginseng Root Extract, Citrus Aurantium Dulcis Peel Extract, Ulmus Fulva Bark Extract, Oenothera Biennis Extract, Hemp Extract, Carbomer, Sodium Hydroxide, Ethylhexylglycerin, Phenoxyethanol, Fragrance, Linalool, Eugenol, Limonene. CBD Daily Intensive Cream Extra Strength from Earthly Body is a rich, creamy CBD Intensive Cream, packed with essential oils including powerful Hemp CBD, Shea Butter, Aloe, Lavender, and other beneficial naturally derived ingredients to target pain and create an immediate soothing sensation, while moisturizing your skin. Now, with three times the strength of our original formula, for those days when you need some extra relief. Moisturizes and soothes skin instantly. Relieves pain and discomfort. Rich, creamy, formula. Contains 180 mg of CBD. It is a difference you will truly feel. Directions: Directions: massage a small amount directly onto skin 3 to 5 times daily. Store in a cool place or at room temperature. Ingredients: Water, Carthamus Tinctorius Safflower Seed Oil, Stearic Acid, Glycerin, Cyclopentasiloxane, Dimethicone, Caprylic/Capric Triglyceride, Cannabis Sativa Hemp Seed Oil, Tocopheryl Acetate, Argania Spinosa Argan Kernel Oil, Butyrospermum Parkii Shea Butter, Simmondsia Chinensis Jojoba Seed Oil, Panthenol, Equisetum Arvense Horsetail Extract, Cucumis Sativus Cucumbert Extract, Aloe Barbadensis Leaf Juice, Rosa Canina Rose Hip Fruit Extract, Punica Granatum Pomegranate Extract, Cymbopogon Schoenanthus Lemongrass Extract, Cetyl Alcohol, Glyceryl Stearate, PEG-100 Stearate, Carbomer, Sodium Hydroxide, Ethylhexylglycerin, Phenoxyethanol, Ocimum Basilicum (Basil) Oil, Melaleuca Viridiflora Leaf Oil, Eucalyptus Globulus Leaf Oil, Pinus Sylvestris Oil, Rosmarinus Officinalis Leaf Oil, Lavandula Angustifolia Lavender Oil, Cedrus Atlantica Wood Oil, Mentha Piperita Peppermint Oil, Menthol, Hemp Extract. Earthly Body CBD Active Spray 2 fluid ounces. Keep your lifestyle carefree and lively with our Active Spray. Use as often as desired so nothing stands in your way. Just point, spray and start feeling better! No-mess spray. Dries quickly. Instantly soothes affected area. Adds a feeling of comfort to your active lifestyle. Packed with Hemp CBD, essential oils, and cooling menthol. Directions: Spray on targeted area of body. Repeat daily or as often as desired. Store in a cool place or at room temperature. Ingredients: Water, Polysorbate 80, Sodium Olivate, Menthol, Hemp Extract, Cannabis Sativa Hemp Seed Oil, Mentha Piperita (Peppermint) Oil, Caprylic/Capric Triglyceride, Arnica Montana Flower Extract, Symphytum Officinale Comfrey Leaf Extract, Ethylhexylglycerin, Phenoxyethanol. 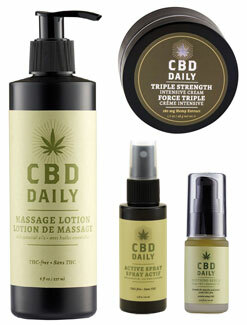 CBD Daily Soothing Serum provides fast acting relief to muscles and joints. Fast acting warming relief. Ultra concentrated. 60 mg Hemp CBD. Soothes muscles, joints, irritation and much more. Directions: Massage small amount directly onto areas of soreness 3 to 5 times a day. Store in a cool place or at room temperature. I have found that using the CBD Daily Intensive Cream (Extra Strength) not only helps my fused neck after having back surgery but also makes me feel a sense of calm. I find it particularly effective when I am in a great deal of pain to combine it with Aleve. They seem to compliment one another and keep me from relying on opiods for pain management. I have tried a couple of CBD products but never anything of this caliber. I am so thankful for a company like yours that provides quality products so that consumers like me can just buy what we need and know that it is safe and made with ingredients that are actually good for us. Great product, highly recommend it! My husband and I decided to try the massage cream for a relaxing massage. I have Type 1 Diabetes which has resulted in suffering from chronic pain in my legs and feet and I found this to not only make my whole body feel good but relieved that pain as well. LOVE this and am definitely coming back for more! I have painful joints from Lupus and I have found that using the Extra Strength CBD Daily Intensive Cream before I go to work in the morning and then again midday helps me tremendously at work. I also got the massage cream and use it as a all over lotion and LOVE it! I feel so good and can't thank you enough for such a great product line. Bravo! My wife and I decided to try this CBD massage lotion for fun as neither of us really have any health issues. I must say we both felt very relaxed from using it on one another and the daily tension was gone after both having very relaxing massages from one another using it. It is really great and honestly, I guess neither of us realized just how tense we were until after having used it to find a level of relaxation and calm that we did not realize we sorely needed. Just bought some more to have on hand for when we run out as this is going to be something we are sure to always have on hand! Thanks for your great customer service and discreet shipping of everything. We love you guys and have been loyal customer for over a decade!